Granite firepits are the latest in luxurious statement pieces for your back yard retreat. This new style of firepit is a beautiful addition to any green space. Granite firepits elevate your back yard experience from drab to extraordinary. 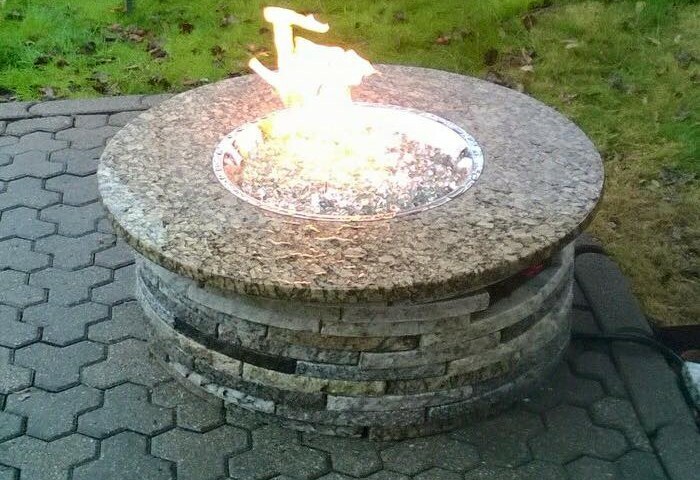 The beauty of granite greatly out shines common metal firepits. Their long lasting exquisiteness will add an upscale flare to any home for years to come. Granite Huggers in Sanger, Texas specializes in all things granite. We’ve been seeing an increasing demand for incredible granite firepits throughout the area. Homeowners want their guests to experience luxury in every aspect. Granite firepits are certainly a step above the traditional metal firepit. We love the uniqueness and beauty that granite adds to every home. Granite firepits offer more customization and beauty than their metal firepit counterparts. This is largely due to granite’s natural beauty and uniqueness. Granite can be found in a large variety of colors and patterns. They can also be constructed to the shape and size that you prefer. This allows you greater customization than you would normally experience with a traditional metal firepit. Your ideal firepit can be round or square and any size that you would like. This means that you’re getting a one of a kind piece that is not only gorgeous but also functional. Many metal firepit options are created from sub-par materials. They also tend to show significant wear and tear over longer periods of time. Granite is a naturally occurring stone that has the potential to last a lifetime while maintaining its beauty. Often times, metal firepits can be costly for what they are. For nearly the same price, you can have a custom granite firepit crafted to fit beautifully into your back yard. At Granite Huggers we create authentic, customized granite firepits for our customers. Our firepits use quality granite that cannot be duplicated. Our unique creations require little maintenance and will last you for years to come. The granite provides a harmonic visual to the nature seen in your back yard as opposed to the harsh alternative of metal firepits. With granite, you never have to worry about your firepit rusting, cracking, or staining your patio. The granite bricks that compose your fireplace stay cool to the touch. This makes them much safer than the dangerously hot metal firepits. They are especially nice to have if your family has small children. Granite firepits are also much sturdier than their metal counterparts. This means that there will be less risk of tipping over. Granite firepits come in many shapes and sizes. They are also customizable to your needs. Not only will they provide warmth but they make a beautiful focal piece for your back yard. When selecting the ideal firepit you’ll want to take several things into consideration. Start by deciding what size of firepit you’d like. If you’ll be entertaining large groups of people and if you have the space for a large piece, you may consider going with a bigger firepit. For smaller spaces you may consider something closer to the size of 36 inches wide. This still allows for a good sized firepit, but is more accommodating to smaller areas. You’ll also want to consider the location. You want to make sure the firepit is placed in a well ventilated area that won’t pose a risk of the fire spreading to other areas. Consider how much clearance you would like around your firepit and plan accordingly. Think about any nearby seating that you would like to have for your guests and make sure that there is a comfortable amount of room. Function is another factor that you’ll want to take into consideration. Think about what purpose you would like your firepit to serve. Some people enjoy simply having an outdoor fire, while others may wish to have a functional firepit that can be used for cooking. If you’re interested in granite fireplaces for cooking then inquire about cooking grate attachments. Some homeowners choose artistic firepits or firepits within tables for a unique piece. You should also consider what type of fuel you want to use in your firepit. Firepits generally use wood, propane, or natural gas. Different fuels come with different expenses so you’ll want to check into which option you prefer and consider the associated costs. One of the biggest appeals to granite firepits are the overall look and customization. This allows you to create a focal point that will compliment other features of your back yard and patio. Choosing a granite color that compliments the outside of your home or other stonework on or around your home is a nice touch. Try to choose a design that is complementary but doesn’t overpower the other features of your back yard and patio. If you are unsure about which style of granite firepit will look best in your home then speak with one of our experts. They’ll be happy to show you which designs will compliment your space. If you have any questions about granite firepits, please contact Granite Huggers in Sanger, Texas at (972) 670-4533.